5 - 5,5.............Bordo von Fürstenfeld. 5,5 - 4.............Jago von Fürstenfeld. 5,5,4 - 4..........Hella von Forell. 5 - 5................Lump von Hagenstolz. Angekört 1A at 2 years of age. Bonita van Rensloo was praised for her fine character which she inherited from immediate ancestors on both sides of her pedigree. She passed her VH 2 (Dutch working test) title and passed the German Erstkörung at 2 years of age with 1A rating for character. Bonita's sire, Alva vom Franckenhorst, also passed the German Erstkörung at 2 years of age with 1A rating and her maternal grand-dam, Gravin Grazie, passed the Swedish Körung. 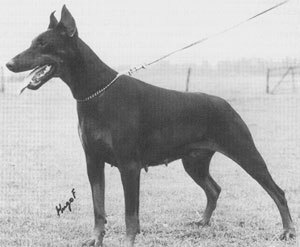 Bonita's brother from a repeat breeding, Cecar van Rensloo, was a Netherlands working Champion and her sister from a later breeding, Eva van Rensloo, was the foundation female for the van de Groote Maat Kennel. Arjanne: SchH 3, FH and passed the German Erstkörung at 2 years of age with 1A plus winner of numerous show titles. She is dam of the van Hermansjomaik “D, F, G, H” litters (Glady). Emir: KNPV PH2 (met lof), Object Guard (met lof) and Reddingshond. Esmir: SchH 1 and passed the ZTP with 1A rating for character and V for conformation plus winner of numerous show titles. She is dam of the van het Wantij “H, K, L, M, O” litters (Hargos, Lara, Odin).